Dune HD Max 4K is a next-generation premium full-sized 4Kp60 HDR media player and Android Smart TV box with Hi-End video quality, BD3D support, HD audio support, HDMI input, 3.5" HDD rack + 3.5" HDD slot, 2nd audio-only HDMI output, Hi-Fi digital audio outputs, Hi-End toroidal power transformer, advanced connectivity. For audiophiles, this model includes Hi-Fi digital audio outputs: coaxial S/PDIF output and professional I2S-E output. Built-in XMOS audio processor provides bit-perfect audio processing with original sample rate, reclocking, and ultra-low jitter. To ensure excellent video and audio quality, Dune HD Max 4K uses Hi-End toroidal power transformer which provides high-quality power to all circuits. 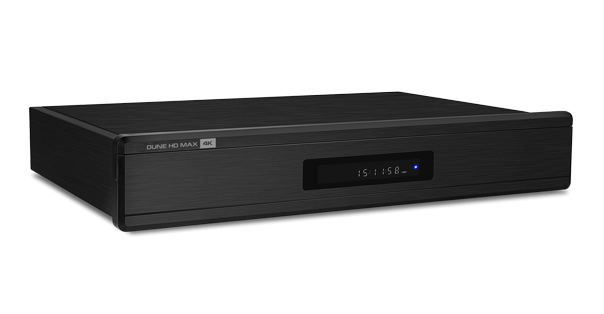 Dune HD Max 4K supports a variety of digital audio and video formats, including the most modern HEVC video codec with 10-bit color encoding, top quality 4K and HD content with very high bit rates, all modern 3D video standards such as MVC, Side-by-Side and Top-and-Bottom, and Hi-End audio formats, including the most modern DTS:X and Dolby Atmos audio formats. Dune HD Max 4K is equipped with 2 GB RAM, 16 GB flash memory, USB Type-C port, USB 3.0 port, three USB 2.0 ports, 3.5" SATA HDD rack, 3.5" SATA HDD slot, 1 GBit Ethernet, 802.11ac Dual Band Wi-Fi, HDMI 2.0a output, second audio-only HDMI output, HDMI 2.0 input, optical and coaxial S/PDIF outputs, Hi-Fi coaxial S/PDIF and I2S-E audio outputs, A/V output, IR in/out ports, RS232 port, Kensington security slot, front panel display.